HIALEAH, FL�FEBRUARY 27, 2017�Alicia Hill Smith's Ahs Uncle Si romped to a two-length win over Shes A Tourist in the $200,000 Sunshine State Derby for Florida-breds Saturday afternoon at Hialeah Park. La Doncella Comminup finished another length back in third. After getting disqualified and placed fifth in his February 6th trial race, jockey Rodrigo Vallejo sent Ahs Uncle Si straight down the inside rail to complete the 400 yards in :19.430 seconds, a 102 speed index with a 5 mph tailwind. Trainer Judd Kearl saddled the Hill homebred to his second official win in five starts. Third two races back in the FQHRA Stallion Stakes Derby, Ahs Uncle Si used the $84,000 Sunshine Derby winner's check to bring his lifetime total to $103,389. The son of Struttin To Beduino is out of Ichies Signature, by Ichie Dancer. 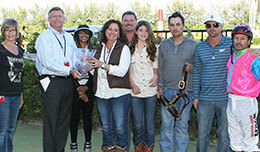 Double A Ranch's Shes A Tourist got off to a slow start but rallied to finish second while earning $36,000. Elio Vazquez conditions the daughter of Ethics Aside from the Okey Dokey Dale mare Deluxcious. Bred by Jorge Luis Gonzalez, the sorrel filly has compiled a (5) 2-1-1 record and earned $53,283. Yordanis Amaro had the riding assignment. After getting bumped at the start, jockey Omar Reyes steadied La Doncella Comminup, before putting in a bid to finish third. Also a daughter of Ethics Aside, the black filly is a homebred for owner/breeder Luis Aguirre. Rogelio Martinez saddled the filly out of Comminup Rosie, by First Down Expected. Making only her fourth career start, La Doncella Comminup earned $24,000 for the effort. Blacks Cartel, Fast Flyin Fireball, Bubbles Cartel Gal, Streakin Knight, Toast To Bono, Burnin For You and Salty Gator completed the field.